Did you know that 75% of Facebook users log into their news feed 11-15 times per day? If your not on social media, you're missing out. If you're looking to optimize your Social Media presence, then take a look at our monthly packages. We offer a broad range of services and packages that be customized to your needs. Let's chat today, and we can start you on a path to success. Each package includes the following services. Quantity of posts increase at each level. Packages can also be customized to suit your needs and budget! Still sitting on the fence about Social Media? ​No problem. We've got the perfect offer. "Let's Chat!" 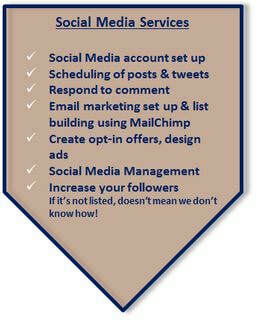 to get your business noticed on the top social media platforms. You owe it to yourself and your business! Some of our SM ad-ons.